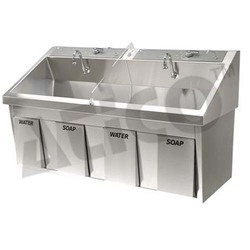 We are actively involved in offering a wide range of Automatic Scrub Sink in the market. Scrub Station wall mounted scrub station, made of heavy duty stainless steel 304 grade designed for splash – free usage without touching the taps soap dispensers directly with the handle. 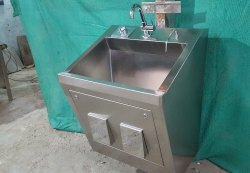 - Scrub station wall mounted scrub Station, made of heavy duty stainless steel 304 grade designed for splash-free usage with out touching the taps soap dispensers directly with the handle. We offer Automatic Scrub Station For Operation Theater In Hospital. The entire unit is fabricated of high quality stainless steel sheets and pipes.the design of trough ensure no stagnation of water.specially design thermostatically controlled water chamber inside the limit maintenance doors in front.The unit is compatible with all std and regular plumbing.